Although a multiplicity of clinical presentations exists for polycystic ovary disease, in 1935, Stein and Leventhal reported the classic symptomatology in a group of women who had amenorrhea, infertility, hirsutism, and enlarged polycystic ovaries. The authors found that, after ovarian biopsy, the women began to menstruate regularly. As was discovered over time, women may have polycystic ovaries, yet their cases may not conform to all of the original criteria for this condition. Therefore, Stein-Leventhal syndrome became a subgroup of a more encompassing disease called polycystic ovary disease. See the images of polycystic ovary disease below. 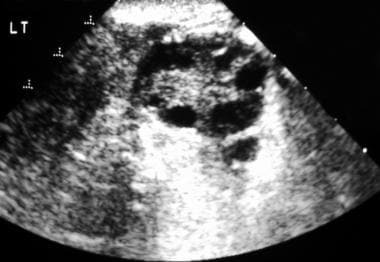 Longitudinal transabdominal sonogram of an ovary. This image reveals multiple peripheral follicles. 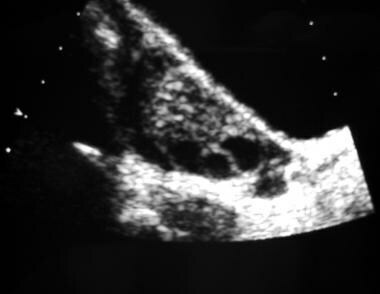 Transverse endovaginal sonogram of the left ovary. This image exhibits numerous peripheral follicles and hyperechoic stroma. Note that none of the follicles is larger than 1.2 cm. Axial T2-weighted magnetic resonance image of the pelvis. This image reveals multiple subcapsular follicles in both ovaries; the follicles are more conspicuous on the left side on this image. Axial T2-weighted magnetic resonance image of the pelvis. This image demonstrates multiple subcapsular follicles in both ovaries; the follicles are more conspicuous on the right side on this image. As more information regarding the nature of the condition has come to light, other terms have been applied, including polycystic ovarian/ovaries syndrome and polyfollicular ovarian disease. In actuality, polycystic ovaries are not the primary cause of amenorrhea or hirsutism in this condition. Rather, they are simply one sign of an underlying endocrinologic disorder that ultimately results in anovulation. Polycystic ovarian syndrome is not a primary disease process. When polycystic ovaries are discovered at radiologic examination, further diagnostic tests are needed to determine the etiology. When the laboratory values are interpreted together with a thorough history as well as physical examination findings, they are useful in the diagnosis of polycystic ovaries. In some patients, such information may lead to a specific cause of the ovarian dysfunction (eg, hyperprolactinemia). When hormone levels do not provide adequate information, ultrasonography may prove useful; however, in the absence of correlative information, the significance of the radiologic findings is difficult to determine. The primary limitation of ultrasonography is that a radiologic diagnosis of polycystic ovaries does not reveal the underlying pathology, if it exists. Further studies are usually necessary to determine the cause of the radiologic finding. Although polycystic ovaries are occasionally identified in patients without polycystic ovarian syndrome, this possibility does not relieve the radiologist of the responsibility to report the finding and recommend further clinical and biochemical evaluations. For patient information resources, see the Women's Health Center, as well as Ovarian Cysts, Amenorrhea, and Female Sexual Problems. Typically, a radiologic evaluation for polycystic ovaries is reserved for patients who have equivocal laboratory findings. However, radiologists make a significant number of incidental diagnoses. 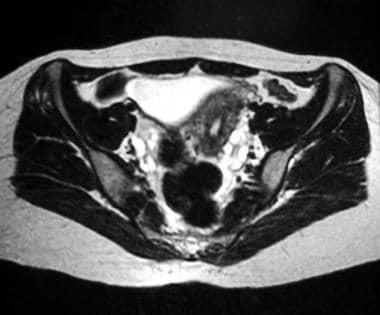 Should the radiologist's assistance be requested in the diagnosis of polycystic ovarian syndrome, the imaging method of choice is transabdominal and/or transvaginal ultrasonography. Polycystic ovaries are characterized by numerous, small (< 1 cm), peripheral cysts that are located throughout the cortex. The ovaries may be slightly larger than normal; however, the ovarian stroma is hypertrophic. Often, the fibrous capsule surrounding the ovary is prominent. Although MRI is sensitive to the presence of follicular cysts, this modality is not specific enough to permit the diagnosis of polycystic ovarian disease without corroborating laboratory values and features from the patient's history. Greater experience is necessary before sufficient criteria can be determined for the diagnosis of polycystic ovarian disease. Changes seen in polycystic ovaries have also been noted in patients without polycystic ovarian syndrome, in patients with oligomenorrhea without a diagnosis of polycystic ovaries, and in patients taking exogenous steroids or clomiphene. The diagnosis remains a clinical one. Usually, the ovaries are enlarged symmetrically, and the shapes change from ovoid to spherical. Ovarian volume can increase by as much as 6 mL; however, almost 30% of patients with a biochemical and pathologic diagnosis of polycystic ovaries have no increase in ovarian volume. The typical polycystic ovary contains numerous follicles at any given time. The follicles are small (0.5-0.8 cm), and no dominant follicle is present. Characteristically, the follicles are peripherally located in the cortex; however, they can occur anywhere in the ovarian parenchyma. The diagnosis of polycystic ovaries should be reserved for patients with at least 5 of these follicles in each ovary. Typically, the ovaries are hypoechoic in relation to the surrounding pelvic fat and myometrium. Polycystic ovaries often display increased echogenicity; however, as many as one third may remain isoechoic or hypoechoic relative to the myometrium. Ultrasonography has a largely corroborative role in the diagnosis of polycystic ovarian syndrome. In a patient with a biochemical diagnosis of polycystic ovaries, ultrasonographic findings may confirm the clinical diagnosis, but they cannot exclude it. Alternatively, the incidental discovery of polycystic ovaries during ultrasonography is not a reliable indicator of polycystic ovarian syndrome. Almost 30% of patients with endocrinologic findings of polycystic ovaries may have normal-sized ovaries on sonograms. Less than 50% of patients with biochemical features of polycystic ovaries and increased ovarian volume have the classic finding of multiple, small, peripheral follicles. Ultimately, the diagnosis should be made on clinical and biochemical grounds. However, normal ultrasonographic findings should not exclude the diagnosis. Alternatively, when polycystic ovaries are an incidental radiologic finding, approximately 25% of the patients have no clinical abnormality. Whether these patients have polycystic ovarian syndrome remains a matter of debate. Again, correlation with biochemical and clinical findings is necessary before a definitive diagnosis is made. Catteau-Jonard S, Pigny P, Reyss AC, et al. Changes in serum anti-mullerian hormone level during low-dose recombinant follicular stimulating hormone therapy for anovulation in polycystic ovary syndrome. J Clin Endocrinol Metab. 2007 Aug 14. epub ahead of print. [Medline]. [Full Text]. Harwood K, Vuguin P, Dimartino-Nardi J. Current approaches to the diagnosis and treatment of polycystic ovarian syndrome in youth. Horm Res. 2007 Apr 5. 68(5):209-17. [Medline]. [Full Text]. Hsu MI, Liou TH, Chou SY, Chang CY, Hsu CS. Diagnostic criteria for polycystic ovary syndrome in Taiwanese Chinese women: comparison between Rotterdam 2003 and NIH 1990. Fertil Steril. 2007 Aug 11. epub ahead of print. [Medline]. Pasquali R, Gambineri A. Polycystic ovary syndrome: a multifaceted disease from adolescence to adult age. Ann N Y Acad Sci. 2006 Dec. 1092:158-74. [Medline]. Setji TL, Brown AJ. Comprehensive clinical management of polycystic ovary syndrome. Minerva Med. 2007 Jun. 98(3):175-89. [Medline]. Setji TL, Brown AJ. Polycystic ovary syndrome: diagnosis and treatment. Am J Med. 2007 Feb. 120(2):128-32. [Medline]. Siassakos D, Wardle P. Polycystic ovary syndrome and pregnancy outcome: red herring or red flag?. BJOG. 2007 Aug. 114(8):922-32. [Medline]. Teede HJ, Hutchison SK, Zoungas S. The management of insulin resistance in polycystic ovary syndrome. Trends Endocrinol Metab. 2007 Aug 13. epub ahead of print. [Medline]. Lawson MA, Jain S, Sun S, Patel K, Malcolm PJ, Chang RJ. Evidence for insulin suppression of baseline luteinizing hormone in women with polycystic ovarian syndrome and normal women. J Clin Endocrinol Metab. 2008 Jun. 93(6):2089-96. [Medline]. [Full Text]. Goodman NF, Cobin RH, Futterweit W, Glueck JS, Legro RS, Carmina E. AMERICAN ASSOCIATION OF CLINICAL ENDOCRINOLOGISTS, AMERICAN COLLEGE OF ENDOCRINOLOGY, AND ANDROGEN EXCESS AND PCOS SOCIETY DISEASE STATE CLINICAL REVIEW: GUIDE TO THE BEST PRACTICES IN THE EVALUATION AND TREATMENT OF POLYCYSTIC OVARY SYNDROME - PART 1. Endocr Pract. 2015 Nov. 21 (11):1291-300. [Medline]. Goodman NF, Cobin RH, Futterweit W, Glueck JS, Legro RS, Carmina E. AMERICAN ASSOCIATION OF CLINICAL ENDOCRINOLOGISTS, AMERICAN COLLEGE OF ENDOCRINOLOGY, AND ANDROGEN EXCESS AND PCOS SOCIETY DISEASE STATE CLINICAL REVIEW: GUIDE TO THE BEST PRACTICES IN THE EVALUATION AND TREATMENT OF POLYCYSTIC OVARY SYNDROME - PART 2. Endocr Pract. 2015 Dec. 21 (12):1415-26. [Medline]. Stein IF, Leventhal ML. Amenorrhea associated with bilateral polycystic ovaries. Am J Obstet Gynecol. 1935. 29:181-91. Hopkinson ZE, Sattar N, Fleming R, Greer IA. Polycystic ovarian syndrome: the metabolic syndrome comes to gynaecology. BMJ. 1998 Aug 1. 317(7154):329-32. [Medline]. Kenigsberg LE, Agarwal C, Sin S, Shifteh K, Isasi CR, Crespi R, et al. Clinical utility of magnetic resonance imaging and ultrasonography for diagnosis of polycystic ovary syndrome in adolescent girls. Fertil Steril. 2015 Nov. 104 (5):1302-9.e1-4. [Medline]. Senaldi L, Gopi RP, Milla S, Shah B. Is ultrasound useful in the diagnosis of adolescents with polycystic ovary syndrome?. J Pediatr Endocrinol Metab. 2015 May. 28 (5-6):605-12. [Medline]. Shah AA, Likes CE, Price TM. Early polycystic ovary syndrome as a possible etiology of unexplained premenarcheal ovarian torsion. J Pediatr Adolesc Gynecol. 2009 Aug. 22(4):265-9. [Medline]. Bachanek M, Abdalla N, Cendrowski K, Sawicki W. Value of ultrasonography in the diagnosis of polycystic ovary syndrome - literature review. J Ultrason. 2015 Dec. 15 (63):410-22. [Medline]. Trivax B, Azziz R. Diagnosis of polycystic ovary syndrome. Clin Obstet Gynecol. 2007 Mar. 50(1):168-77. [Medline]. Lalwani N, Patel S, Ha KY, Shanbhogue AK, Nagar AM, Chintapalli KN, et al. Miscellaneous tumour-like lesions of the ovary: cross-sectional imaging review. Br J Radiol. 2012 May. 85(1013):477-86. [Medline]. [Full Text]. Marsh CA, Berent-Spillson A, Love T, Persad CC, Pop-Busui R, Zubieta JK, et al. Functional neuroimaging of emotional processing in women with polycystic ovary syndrome: a case-control pilot study. Fertil Steril. 2013 Jul. 100(1):200-207.e1. [Medline]. Romualdi D, Di Florio C, Tagliaferri V, De Cicco S, Gagliano D, Immediata V, et al. The Role of Anti-Müllerian Hormone in the Characterization of the Different Polycystic Ovary Syndrome Phenotypes. Reprod Sci. 2015 Dec 29. [Medline]. Mitchell DG, Gefter WB, Spritzer CE, et al. Polycystic ovaries: MR imaging. Radiology. 1986 Aug. 160(2):425-9. [Medline]. [Full Text]. Oztoprak I, Eqilmez H, Oztoprak B, Gümüs C. Complicated giant polycystic ovary mimicking tumor: MR imaging findings. Pediatr Radiol. 2007 Feb. 37(2):233-6. [Medline]. Scoutt LM, McCarthy SM. Female pelvis. Stark DD, Bradley WG, eds. Magnetic Resonance Imaging. 3rd ed. St Louis, Mo: Mosby-Year Book; 1999. 557-90. Kimura I, Togashi K, Kawakami S, et al. Polycystic ovaries: implications of diagnosis with MR imaging. Radiology. 1996 Nov. 201(2):549-52. [Medline]. [Full Text]. Brown M, Park AS, Shayya RF, Wolfson T, Su HI, Chang RJ. Ovarian imaging by magnetic resonance in adolescent girls with polycystic ovary syndrome and age-matched controls. J Magn Reson Imaging. 2013 Jan 4. [Medline]. [Full Text]. Allemand MC, Tummon IS, Phy JL, et al. Diagnosis of polycystic ovaries by three-dimensional transvaginal ultrasound. Fertil Steril. 2006 Jan. 85(1):214-9. [Medline]. Fulghesu AM, Angioni S, Frau E, et al. Ultrasound in polycystic ovary syndrome the measuring of ovarian stroma and relationship with circulating androgens: results of a multicentric study. Hum Reprod. 2007 Sep. 22(9):2501-8. [Medline]. Lam PM, Raine-Fenning N. The role of three-dimensional ultrasonography in polycystic ovary syndrome. Hum Reprod. 2006 Sep. 21(9):2209-15. [Medline]. Mahajan NN, Singh R, Mahajan KN, Levine D. Sonographic evaluation of the endometrium in patients with a history or an appearance of polycystic ovarian syndrome. J Ultrasound Med. 2007 Jun. 26(6):862; author reply 862. [Medline]. Nardo LG, Buckett WM, Orio F Jr. Ultrasonography in polycystic ovary syndrome: an update. J Reprod Med. 2007 May. 52(5):390-6. [Medline]. Ozkan S, Vural B, Caliskan E, et al. Color Doppler sonographic analysis of uterine and ovarian artery blood flow in women with polycystic ovary syndrome. J Clin Ultrasound. 2007 Jul-Aug. 35(6):305-13. [Medline]. Sun L, Fu Q. Three-dimensional transrectal ultrasonography in adolescent patients with polycystic ovarian syndrome. Int J Gynaecol Obstet. 2007 Jul. 98(1):34-8. [Medline]. Vizer M, Kiesel L, Szabó I, et al. Assessment of three-dimensional sonographic features of polycystic ovaries after laparoscopic ovarian electrocautery. Fertil Steril. 2007 Jun 8. epub ahead of print. [Medline]. Hann LE, Hall DA, McArdle CR, Seibel M. Polycystic ovarian disease: sonographic spectrum. Radiology. 1984 Feb. 150(2):531-4. [Medline]. [Full Text]. Ritchie WGM. Ultrasound evaluation of normal and induced ovulation. Callen PW, ed. Ultrasonography in Obstetrics and Gynecology. Philadelphia, Pa: WB Saunders Co; 1994. 569-85. Swanson M, Sauerbrei EE, Cooperberg PL. Medical implications of ultrasonically detected polycystic ovaries. J Clin Ultrasound. 1981 May-Jun. 9(5):219-22. [Medline].